Scott Speed picked up the 4th last-place finish of his NASCAR Sprint Cup Series career in Saturday night’s Capitol City 400 presented by Virginia is for Lovers at the Richmond International Raceway when his #95 TWD Drywall Ford fell out with electrical problems after 19 of the race’s 400 laps. The finish was Speed’s second in as many starts in 2012 and his first since Texas, two races ago. As a result, Speed is the first Cup driver to score more than one last-place finish this season. Speed qualified 36th for Saturday’s race at an average speed of 125.839 mph, ranking him fifth among the ten "go-or-go-home" drivers who attempted to qualify. Joining Las Vegas last-placer J.J. Yeley as the other driver who failed to qualify was Kansas last-placer Scott Riggs, who also was the only DNQ from the Nationwide race the previous night. In the race, it first appeared that Mike Bliss would score his first last-place finish of 2012 in the Randy Humphrey and Mark Smith-owned #19 Toyota. Bliss held the 43rd spot in the early laps before Speed pulled behind the wall under green, followed four laps later by Bliss. Joe Nemechek, still without a last-place finish in 2012, came home 41st, but scored an impressive 13th in the Nationwide race. *This is Speed’s second-consecutive last-place finish in a Cup race at Richmond. 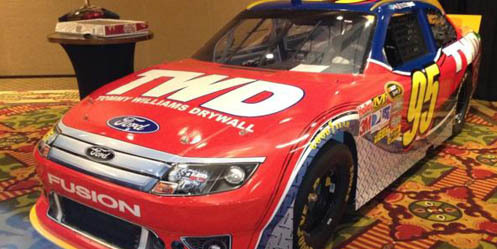 Last fall, he was involved in an early multi-car crash while driving Dusty Whitney’s #46 Ford. *The #95 had never before finished last in a Cup race at Richmond. Jeff Green picked up the 31st last-place finish of his NASCAR Nationwide Series career in Friday night’s Virginia 529 College Savings 250 at the Richmond International Raceway when his unsponsored #10 TriStar Motorsports Toyota fell out with a vibration after completing 3 of the race’s 250 laps. 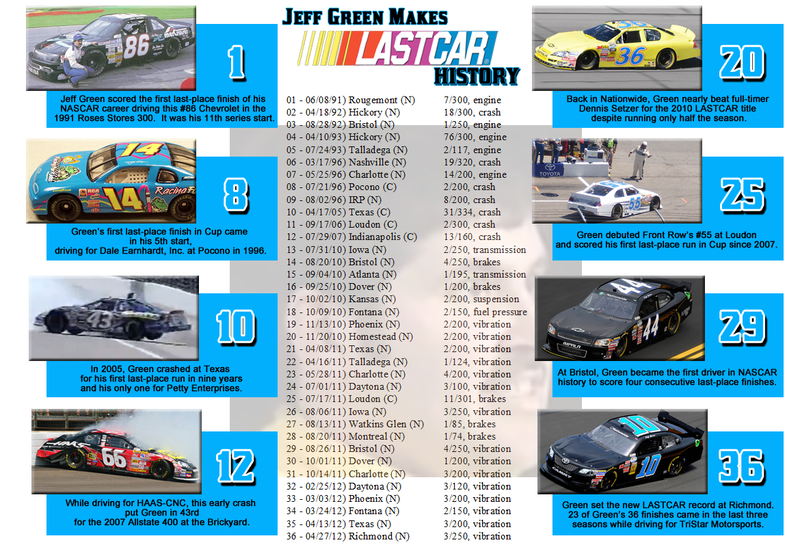 The finish was not only Green’s third in a row and fifth of 2012, but was the 36th of his NASCAR career, a new LASTCAR record. 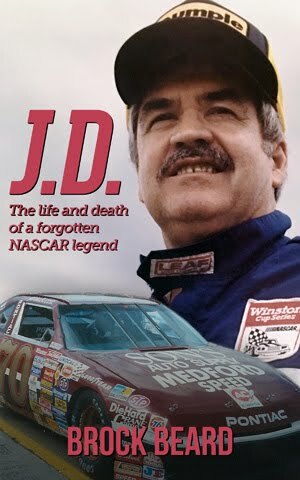 It is the first time this record has changed hands since Derrike Cope claimed it from the late J.D. McDuffie at Montreal in 2008. 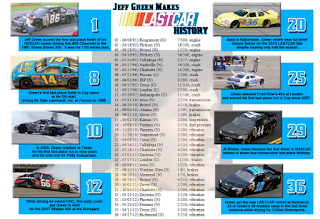 23 of Green’s finishes came while driving for TriStar’s Nationwide Series team in the last three years, including a record-setting four-race streak last August. Friday’s record-breaking finish came in Green’s 593rd start in NASCAR’s top three divisions. Green qualified 41st for Friday’s race at an average speed of 112.145 mph, ranking him eleventh among the fourteen "go-or-go-homers" who attempted to qualify. 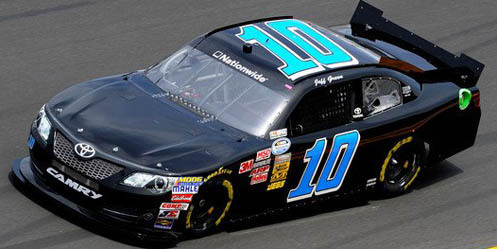 *Neither Jeff Green, nor the #10, had ever before finished last in a Nationwide Series race at Richmond. EDIT (April 11, 2013): Due to updated statistics indicating that Derrike Cope scored 36 and not 35 last-place finishes, due to one more last-place finish in a Nationwide race at Darlington in 1995, Jeff Green did not actually beat Cope's mark until his last-place run at Road America in June 2012. 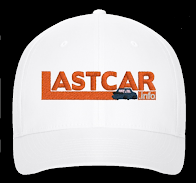 Although the graphic is technically inaccurate, since he needed 37 and not 36 last-place runs to beat Cope, it will be reflected accurately in the upcoming LASTCAR Nationwide Series Chronicle. Scott Riggs picked up the 4th last-place finish of his NASCAR Sprint Cup Series career in Sunday’s STP 400 at the Kansas Speedway when his #23 North Texas Pipe Chevrolet fell out with rear gear problems after 18 of the race’s 267 laps. The finish was Riggs’ first of the 2012 season and his first in Cup Series competition in thirty-one races. That race was last June’s 5-Hour Energy 500 at Pocono, where his #81 WhitneysCollision.com Chevrolet fell out after 17 laps due to brake trouble. Over the 2011-2012 offseason, Riggs landed a Cup Series ride with R3 Motorsports, a longtime Nationwide Series team that has recently made frequent attempts to enter NASCAR’s top racing division. The team’s DNQ streak continued through SpeedWeeks, when Robert Richardson was unable to race the #23 Toyota into the Daytona 500 field. Then, as the team switched to Chevrolets and put Riggs behind the wheel, the R3 team qualified for six of the next seven races, missing only last month’s race at Las Vegas. Still, as R3 continues to pool its funds for its Nationwide Series program, Riggs has parked the #23 each week - twice he finished 41st and three times he came home 42nd. Sunday proved to be R3's first-ever last-place finish in Cup Series competition. In qualifying, Riggs put the #23 into the 34th position at an average speed of 173.249 mph, ranking him fourth among the eleven "go-or-go-homers" who attempted to qualify. It was vindication for Riggs, who had missed the show for the Truck Series race the day before while driving Mike Harmon’s #74. Riggs’ run in qualifying also bumped out of the field Jeff Green, still tied for the all-time LASTCAR lead. Last week, Green was tabbed as the driver for the #33 team that finished last at Fontana with Brendan Gaughan, but the car lacked speed in time trials. This Friday in the Nationwide Series race at Richmond, Green is expected to run the #10 TriStar Motorsports Toyota in which he has scored the most recent three of his record-tying 35 NASCAR finishes. Another 43rd on Friday will break his tie with Derrike Cope, putting a new leader on top for the first time since Cope beat the record of the late J.D. McDuffie by scoring his 33rd finish in the Nationwide race at Montreal on August 2, 2008. *This was the first last-place finish in Cup for the #23 since 2002, when the number belonged to Bill Davis Racing and the Hills Bros. Dodge driven by Hut Stricklin. Stricklin’s car came home 43rd in the 2002 MBNA America 500 at Atlanta in the spring of that year, having lost an engine after 164 laps. *This was Riggs’ first last-place finish in a Cup race at Kansas. *For the third time in the last four Cup races at Kansas, the last-place finisher fell out with rear gear problems as the listed cause. 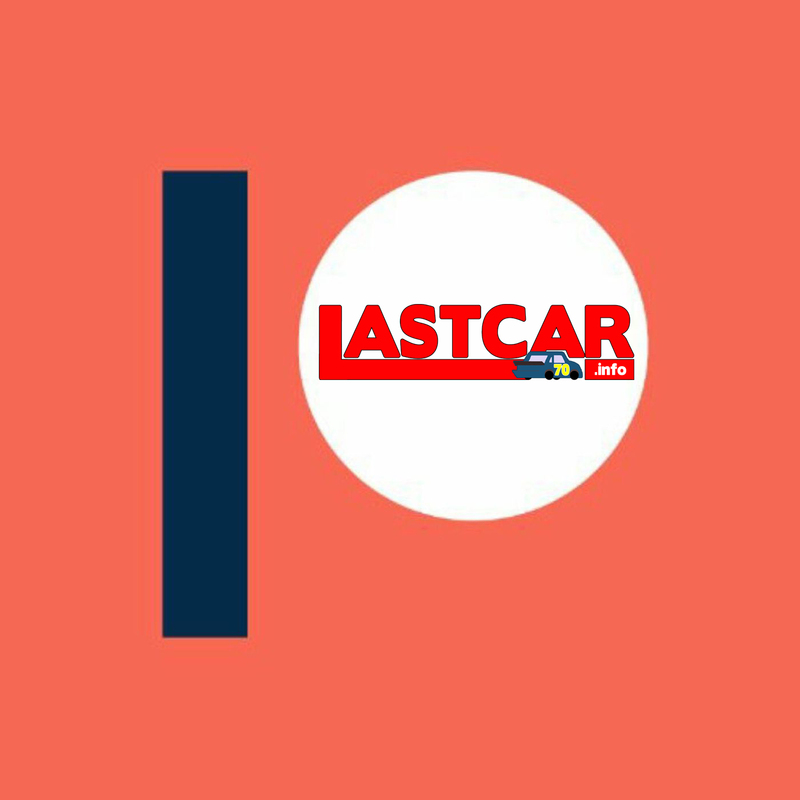 With eight different last-place finishers in the first eight races, 2012 is the most competitive LASTCAR season since 2008, which started with 17 different finishers. The last three seasons began with streaks of only four, two, and six, respectively. 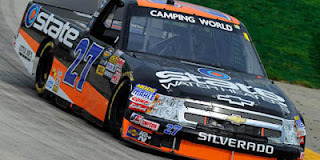 Jeb Burton picked up the 1st last-place finish of his NASCAR Camping World Truck Series career in Saturday’s SFP 250 at the Kansas Speedway when his #27 State Water Heaters Chevrolet was involved in a single-truck crash after 2 of the race’s 167 laps. The finish came in Burton’s third series start. 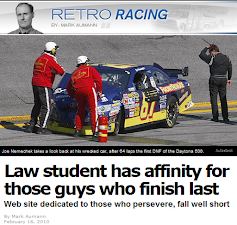 The 19-year-old son of 2002 Daytona 500 winner Ward Burton began his rookie season at Martinsville, where he finished 13th. Last Sunday at Rockingham, he bested this finish with an 11th-place run. Combined with Ward’s 8th-place run in the #27 at Daytona, Hillman Racing was off to a solid start heading to Kansas. Burton qualified 25th for Saturday’s race at an average speed of 167.999 mph. On the first lap of the race, Burton made contact with the outside wall in turns three and four, then cut down a tire and hit the wall much harder in turn one. The damage was enough to take him out of the race. *This was the #27's first last-place finish in nine races, dating back to when Brent Raymer’s S&W Services Chevrolet fell out with a vibration after two laps of last fall’s race at Kentucky 225 at the Kentucky Speedway. *Although neither Ward Burton and his brother Jeff have never finished last in Truck Series competition, both have only a combined five series starts. Scott Speed picked up the 3rd last-place finish of his NASCAR Sprint Cup Series career in Saturday’s Samsung Mobile 500 at the Texas Motor Speedway when his #95 Tommy Williams Drywall Ford fell out with overheating problems after 13 of the race’s 334 laps. The finish was Speed’s first of 2012 and his first in Sprint Cup competition since he was involved in an early crash at Richmond while driving for Dusty Whitney, seventeen races ago. Speed qualified 38th at a speed of 185.122 mph, ranking him sixth among the eleven “go-or-go-homers” who attempted to qualify. This put Speed’s team - Texas-based Leavine Family Racing - into their first race of 2012. It was also Speed’s first Cup race of the season, two weeks after he narrowly missed the show at Martinsville while driving the #52 for Hamilton-Means Racing. In the race, Speed was one of many drivers to make at least one unscheduled pit stop during the opening 67-lap green-flag run. Of this group, Speed was the first to fall out of the race, taking 43rd from Mike Bliss’ #19 before the first caution fell. *The last time the #95 finished last in a Cup Series race was in the fall of 2005, when Stanton Barrett’s Stanton Barrett Racing Chevrolet fell out with an engine failure after 110 laps of the Subway 500 at Martinsville. *Neither a car #95 nor Speed had ever before finished last in a Cup race at Texas. *A Cup Series driver had never before finished last at Texas due to overheating problems. *This was the first Cup Series last-place finish for the Leavine Family Racing team in its fifth series start. Jeff Green picked up the 30th last-place finish of his NASCAR Nationwide Series career in Friday’s O’Reilly Auto Parts 300 at the Texas Motor Speedway when his unsponsored #10 TriStar Motorsports Toyota fell out with a vibration after completing 3 of the race’s 200 laps. The finish was Green’s fourth of the 2012 Nationwide Series season, his second in a row, and his 35th across all three of NASCAR’s top divisions, thus tying him with Derrike Cope for the most last-place finishes in NASCAR history. Green qualified 22nd at a speed of 175.177 mph, ranking him third behind Cup regulars Joey Logano and Dale Earnhardt, Jr. among the fifteen “go-or-go-homers” who attempted to qualify. Early in the race, Chase Miller was the first car to go a lap down when his #46 The Motorsports Group Chevrolet made an unscheduled stop. Green followed soon after, apparently headed for a 42nd-place finish. However, when Miller returned to turn a few more laps, Green fell to 43rd in the final running order. Miller finished 39th. Later in the evening, Green drove in relief of ailing TriStar Motorsports teammate Eric McClure and brought his #14 Hefty / Reynolds Wrap Chevrolet home in the 24th spot. Morgan Shepherd and Joe Nemechek, who came into Texas tied with Green with 34 NASCAR last-place finishes apiece, both failed to qualify for a race last weekend. Nemechek missed his second Cup race of the year and finished 17th in the Nationwide race while Shepherd suffered his third DNQ of the 2012 Nationwide Series season. 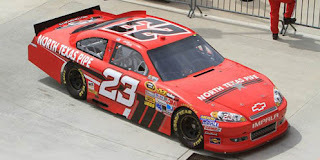 *This was Green’s second-straight last-place finish in the spring Nationwide Series race at Texas. Last spring, his #44 Chevrolet exited after two laps with a vibration. *The #10 had never before finished last in a Nationwide Series race at Texas. Grant Enfinger picked up the 1st last-place finish of his NASCAR Camping World Truck Series career in Sunday’s Good Sam Roadside Assistance 200 at the Rockingham Speedway when his unsponsored #60 Turn One Racing Chevrolet fell out with transmission problems after completing 12 of the race’s 200 laps. The finish came in Enfinger’s fifth series start. Enfinger, a standout in the ARCA series, qualified a strong 9th in Sunday’s field at a speed of 142.885 mph. He avoided disaster when point leader and Daytona winner John King crashed on the backstretch on Lap 4, but pulled behind the wall soon after the ensuing restart. King returned to complete a total of 56 laps, leaving Enfinger in the 36th and final finishing position. King finished 33rd. 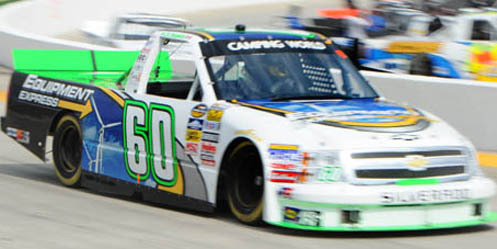 *This was the first Truck Series last-place finish for Stacy Compton’s Turn One Racing team since Talladega last fall, when J.J. Yeley drove the team’s #66 until a transmission problem after the opening lap. Two days before Sunday’s race, Compton missed qualifying for his first Cup race since Daytona in 2003 when his #74 Cup car was too slow in time trials at Texas. *The last time the #60 finished last in a Truck race was in 2010, when current Formula 1 driver Narain Karthikeyan crashed his SafeAuto Insurance Chevrolet 7 laps into the O’Reilly Auto Parts 200 at Kansas. At the time, the #60 was owned by Jeff Wyler. *Sunday’s race was the first for any of NASCAR’s top three divisions at Rockingham since February 22, 2004. In the Cup race held that day, Joe Ruttman finished last, his #09 Phoenix Racing Dodge parked after the opening lap because the team failed to bring a pit crew to the track. Reed Sorenson picked up the 6th last-place finish of his NASCAR Sprint Cup Series career in Sunday’s Goody’s Fast Relief 500 at the Martinsville Speedway when his unsponsored #74 Turn One Racing Chevrolet fell out with brake problems after completing 25 of the race’s 515 laps. The finish was Sorenson’s first of the 2012 season and his first in Sprint Cup competition since the 2010 Showtime Southern 500 at Darlington, when he drove the #32 for the now-defunct Braun Racing team. Sorenson qualified 35th at a speed of 95.223 mph, ranking him fifth among the eleven “go-or-go-homers” who attempted to qualify for the race. This put Stacy Compton’s Turn One Racing team into its third consecutive race since its debut back at Bristol. After two 42nd-place finishes, this then became the team’s first-ever last-place finish. *Combined with Rick Crawford’s last-place run in the Truck Series race the previous day, the #74 finished last in both the weekend’s NASCAR events at Martinsville. The last time a number swept a weekend’s last-place finishes was at Watkins Glen in 2010, when Matt Carter (Nationwide) and Scott Speed (Cup) both fell out early in the #82. 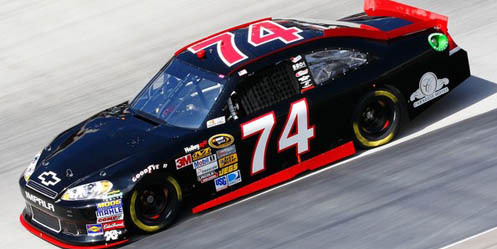 *The #74 had not finished last in a Cup Series race since 2006, when all-time LASTCAR leader Derrike Cope scored his record 35th NASCAR last-place finish in the 2006 UAW-Ford 500 at Talladega. Cope fell out after 9 laps with overheating problems. *The #74 had not finished last in a Cup Series race at Martinsville since September 24, 1972 when Bill Shirey’s 1970 Plymouth fell out of the Old Dominion 500 after 19 laps with overheating problems. 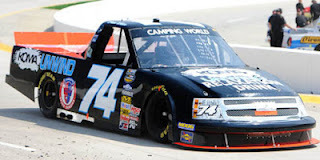 Rick Crawford picked up the 6th last-place finish of his NASCAR Camping World Truck Series career in Saturday’s Kroger 250 at the Martinsville Speedway when his #74 Koma Unwind Relaxation Drink Chevrolet fell out with brake problems after completing 6 of the race’s 250 laps. The finish was Crawford’s first of the 2012 season and his first in Truck Series competition since the 2005 season opener at Daytona, when his #14 Circle Bar Motel & RV Park Ford was involved in this spectacular single-truck crash off turn four. At Martinsville, Crawford gave team owner Mike Harmon his first start of 2012 by qualifying 23rd at a speed of 93.668 mph. The speed ranked Crawford fifth among the eighteen “go-or-go-homers” who attempted to qualify, more than enough to best the seven teams that missed the show. *This was the #74's first last-place finish since last fall at Chicagoland, nine races ago. Mike Harmon drove the @hrmn8ter Chevrolet that day and fell out after three laps with transmission troubles. 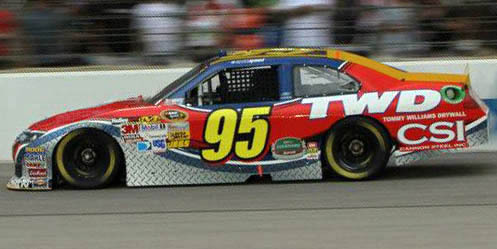 Neither the number nor Crawford had ever before finished last in a Truck race at Martinsville.